Valentine's Day Educational FUN for the Kiddos! You are here: Home / Family / Kids Activities / Valentine’s Day Educational FUN for the Kiddos! Valentine’s Day is a Hallmark holiday, but I still wholly embrace it! I am in love with love, and I can’t get enough of the sappy this time of year. From heart candies to red roses, from Llama Llama I Love You books to romantic gestures, it’s a time when the love in the air is palpable. If you recall, I love to capitalize on any occasion as a learning opportunity, and Valentine’s Day is no exception! My friends at Education.com make that SO easy! They do all the heavy lifting so that all I have to do is click a button and download fun, educational and THEMED games for my little one. And just in case you think that the Valentine’s Day scramble OMPE unscrambles to spell MOPE (instead of the correct POEM).. whoops!.. they include answer keys! 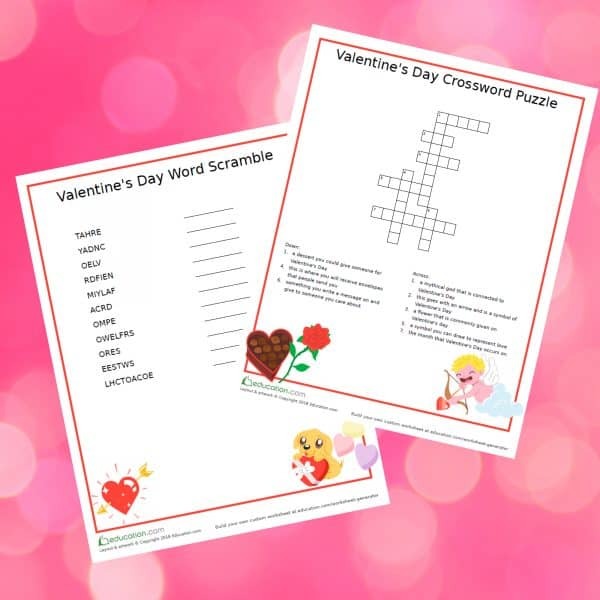 Celebrate friendship as you practice spelling with this fun Valentine’s Day word scramble and a crossword puzzle. Be sure and check out Education.com for more spelling and printables like this! 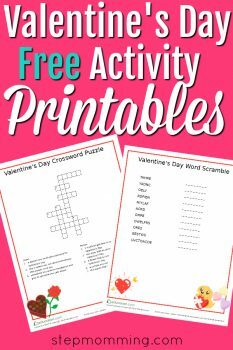 Subscribe to Get Your FREE Valentine’s Day Worksheets! Exclusive for Stepmomming subscribers, FREE Valentine’s Day worksheets sent directly to your inbox! In fact, when you subscribe, you’ll get access to ALL of our freebies! Beyond worksheets, there are so many other activities you could do to capitalize on the educational opportunity of Valentine’s Day! Take advantage of this Hallmark holiday as a chance to get your children engaged in educational activities. I know I will! PS: Have you seen these love language ideas for your children?